Board Game Saturday on Wells 24 March 2012 | Action Points! Timeline is a very simple game. The game is basically a stack of cards with a picture and name of an invention (or discovery, music, book) on one side, and the date when that item was invented/created/discovered on the reverse. Each player gets a certain number of cards non-date side up, and one random card is drawn from the deck and placed in the middle of the table date side up. 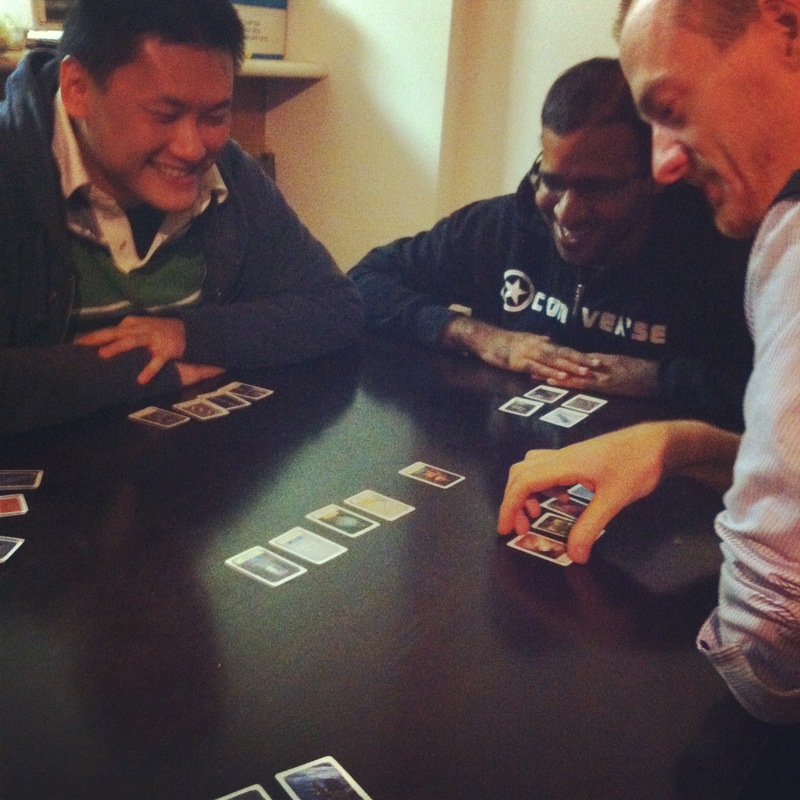 Each player in turn then plays down a card next to an existing card on the table, trying to get it in the correct location by creating a timeline. One direction is nominated as “earlier” and the other as “later”, and you try to fit the cards in the correct position, which could be between two other cards. Once you place a card, you flip it to the date side to see if its location is correct. If it is, you leave it there to continue the timeline. If it isn’t you discard the card and draw another from the deck. The first person to get rid of all their cards wins the game. We played 2 games of Timeline on Saturday, but I had actually brought it to work the previous week and we played a game one lunchtime. I think everyone who has played this game has enjoyed it. The concept is simple, but it is still pretty entertaining to guess when certain items were invented. Apparently it took 100 years from the “invention” of the cork to when the corkscrew was invented. One issue with the game is there may be some ambiguity to when certain inventions were actually invented, but we just follow what the card says. Also, replayability is fairly low as you can definitely run through the cards pretty quickly and start memorising the dates. The version that I got is actually Timeline: Inventions which primarily deals with Inventions and the French version already has 2 expansions (Discoveries and Events), and I certainly feel that this game is better served with more expansions. It’s a quick, entertaining filler and can work as a good short party game, as the inventions usually provoke discussion. I also think it would be a very good tool to teach history with. I could see creating your own cards for historical events and using them to play this game, and it would be a pretty good way to teach historical dates.Personally though, I’ll probably be on the lookout for more expansions to increase the lifespan of this game. 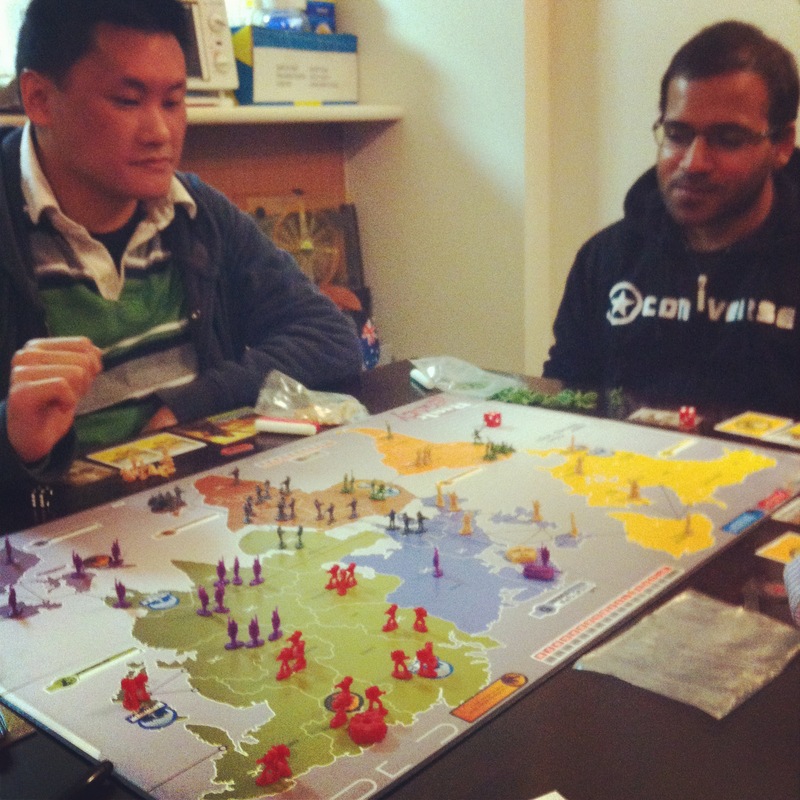 Next up was our third game of Risk Legacy. Jinwei and Gerald were not around this time, so Jeff and Prateek took their places. Steven picked first and started off with Saharan Republic yet again as it now provides an additional power, starting in Europe. I mean, Stevetopia. Prateek chose next and chose Enclave of the Bear and started in South America, while Daniel took Khan Industries and started in Africa. I chose Imperial Balkania and started in the easily defensible Australia while Jeff was left with Die Mechaniker and Northern Asia. We realised that we made a mistake in our previous game by letting people start in minor cities, but we corrected for this game. As we have now opened the Player Eliminated envelope, there will be spoilers in the game description and pictures, so if you were hoping to avoid them I am sorry. 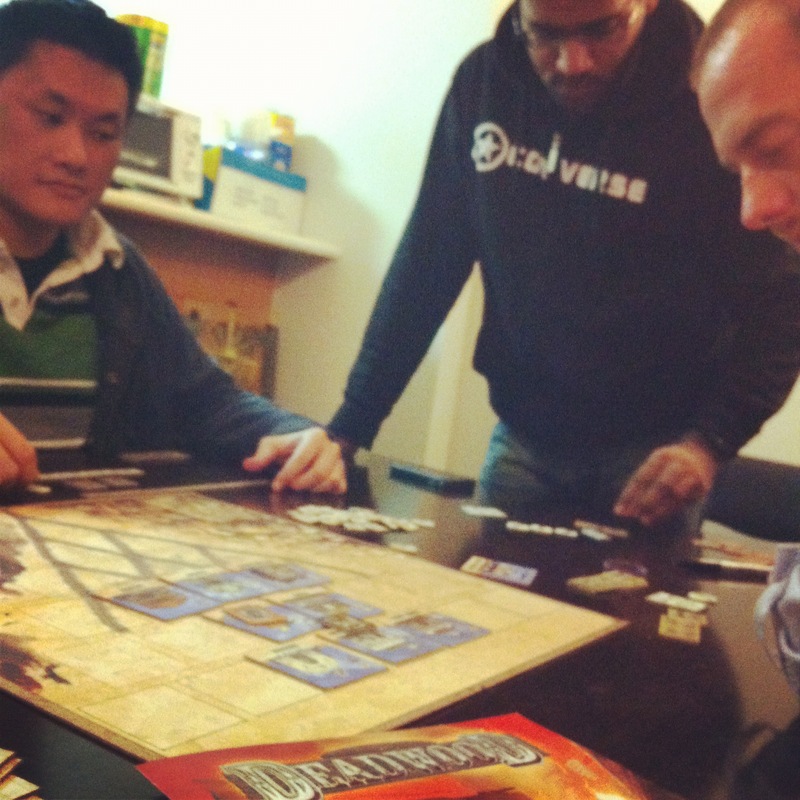 Daniel, Jeff and myself got Mercenary Scar cards and proceeded to add mercenaries in Madagascar, Indonesia and Yakutsk. Everyone was more conservative in this game as there was no race to eliminate Steven. I made headways into Asia, while everyone else expanded on their own continents. 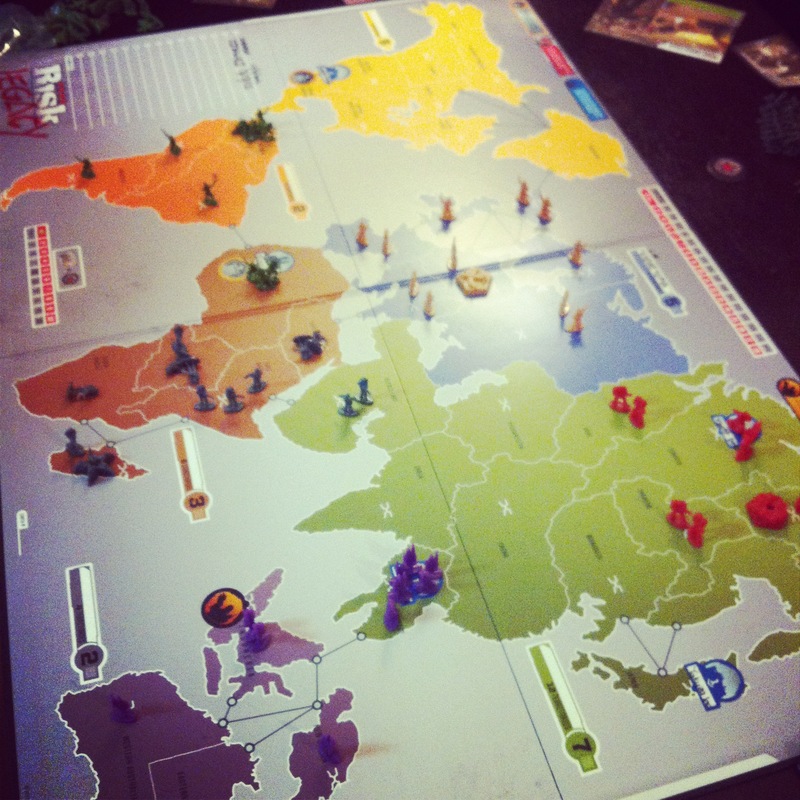 Steven managed to get Stevetopia early and used his additional troops to make a bid for North America. However, Daniel and I harassed him and wrested away total control of Stevetopia from him. I even managed to make it all the way to his HQ while Steven then took Prateek’s HQ in South America while Prateek prevented Daniel from fully controlling Africa. Steven was finally successful in his conquest of America after turning in resource cards for a huge army. I managed to collect 5 resource cards but did not manage to hold onto the HQ in Stevetopia while Jeff made a push for my HQ in Australia. Daniel then made a huge push north into Stevetopia and took the HQ there, and managed to take his fourth Red Star when he drew the last coin resource card while holding the most territories. 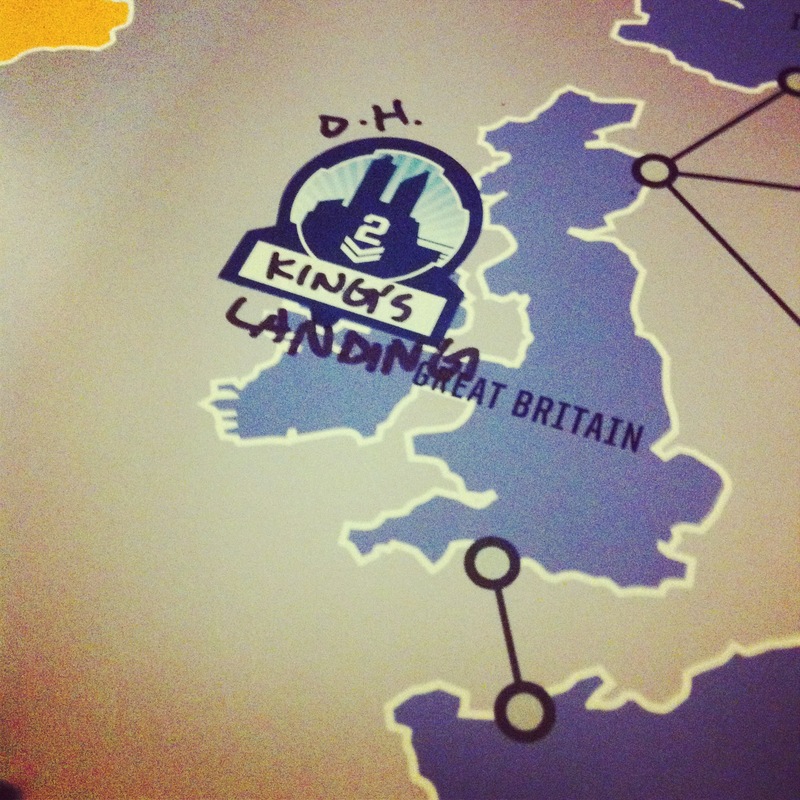 As his reward, Daniel founded the Major City of King’s Landing in Great Britain. 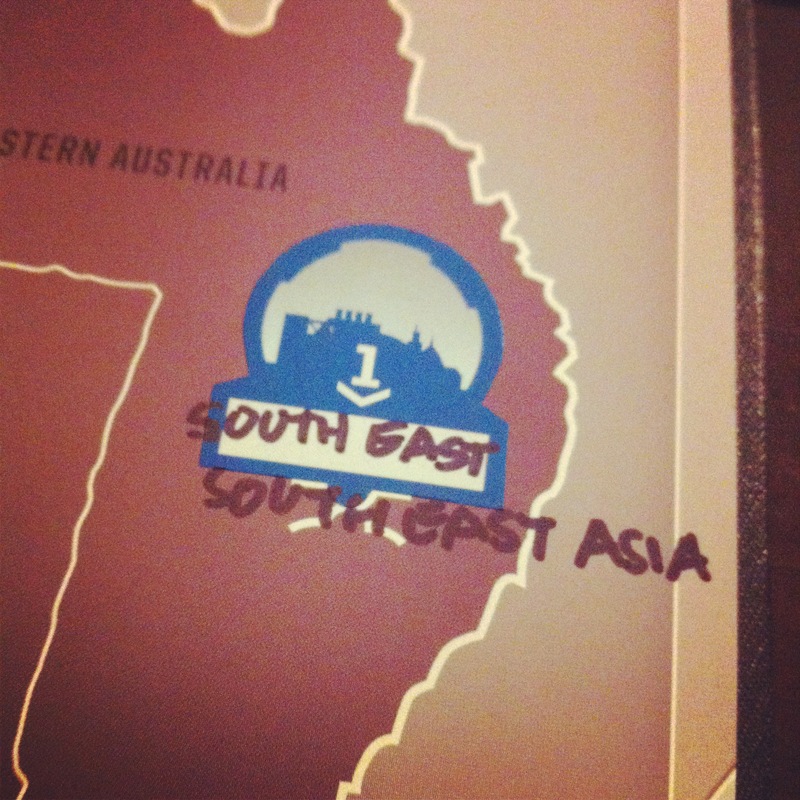 I founded the city of South East South East Asia in Eastern Australia. 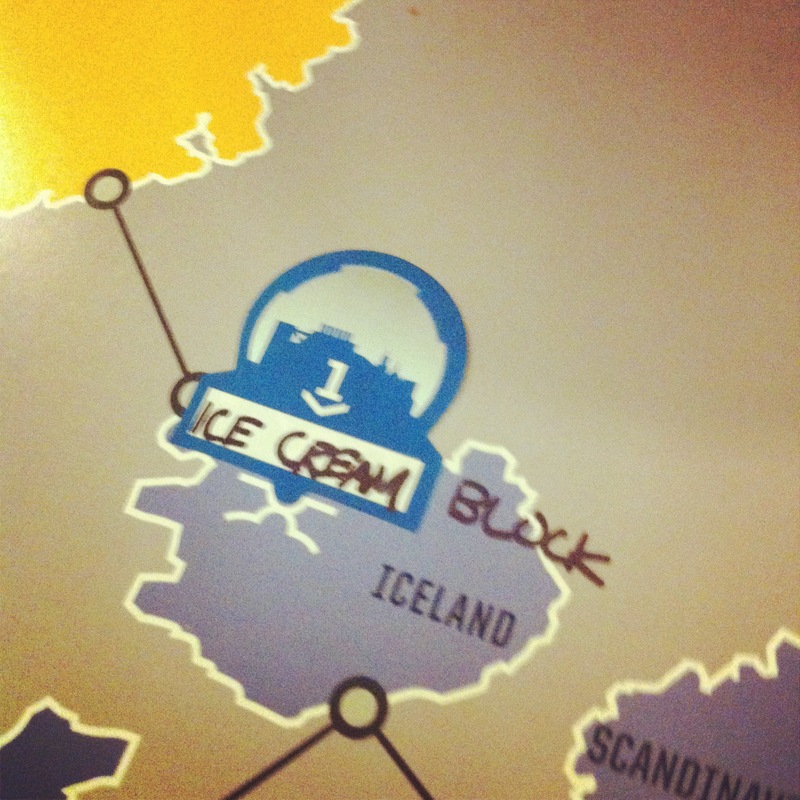 Prateek founded the city of Ice Cream Block in Iceland. 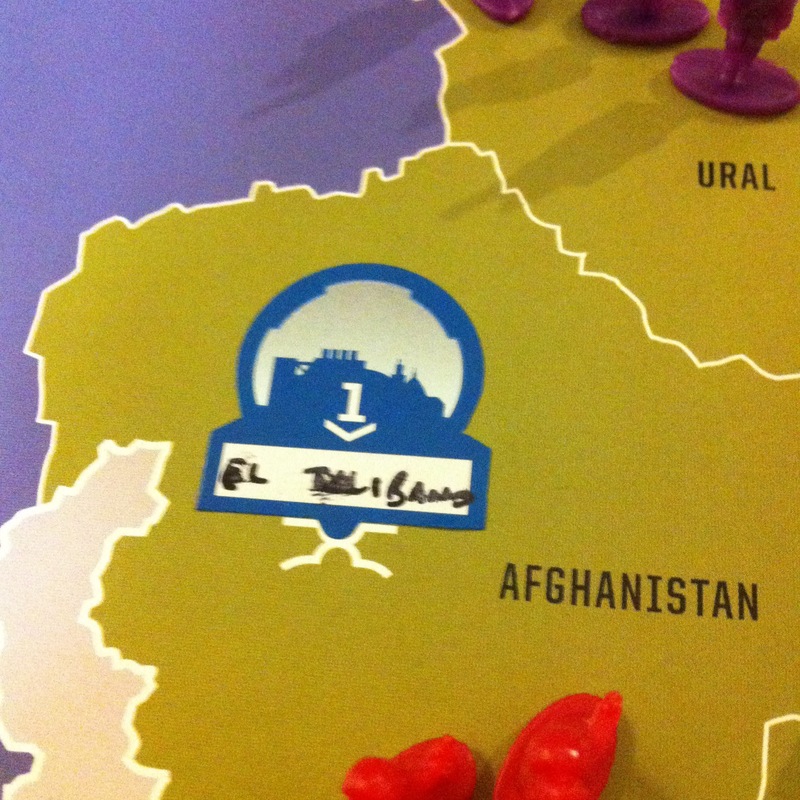 Jeff founded the city of El Taliban(a?) in Afghanistan. 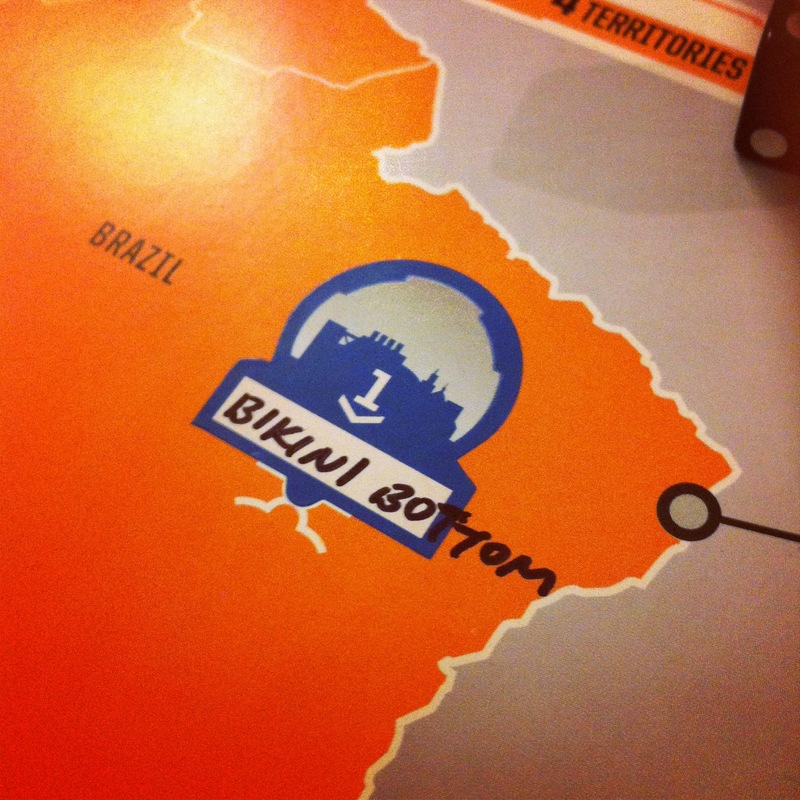 Finally, Steven founded Bikini Bottom in Brazil. 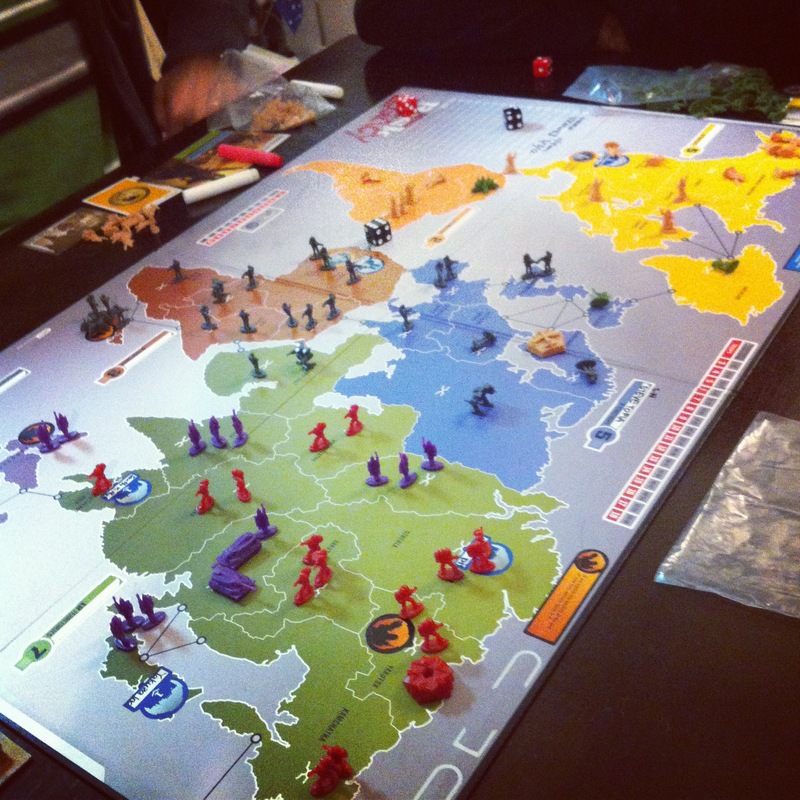 Risk Legacy continues to be great fun. Games are fairly quick and exciting. The addition of the Mercenary scars provide incentives to hold those territories for the bonus troops, which are great for defense, allowing you to focus your other troops on attacking. Daniel and Steven had great success this game with their well-timed expansions, although it was ultimately Daniel that gained the victory. Another turn would have possibly let Steven overwhelm the board with his troops and make a run for the HQs. I was also fairly close until Daniel took the Eur…Stevetopia HQ. I probably should have put more defenders in Eur…Stevetopia. A great end to a fun, tense game. I am excited for the next game, as the minor city marks are almost all gone and we will definitely be opening at least one envelope by the end of the next game. I felt I owed it to the spirit of the Achievement List to continue playing all my unplayed games, so we sat down for a game of Deadwood. 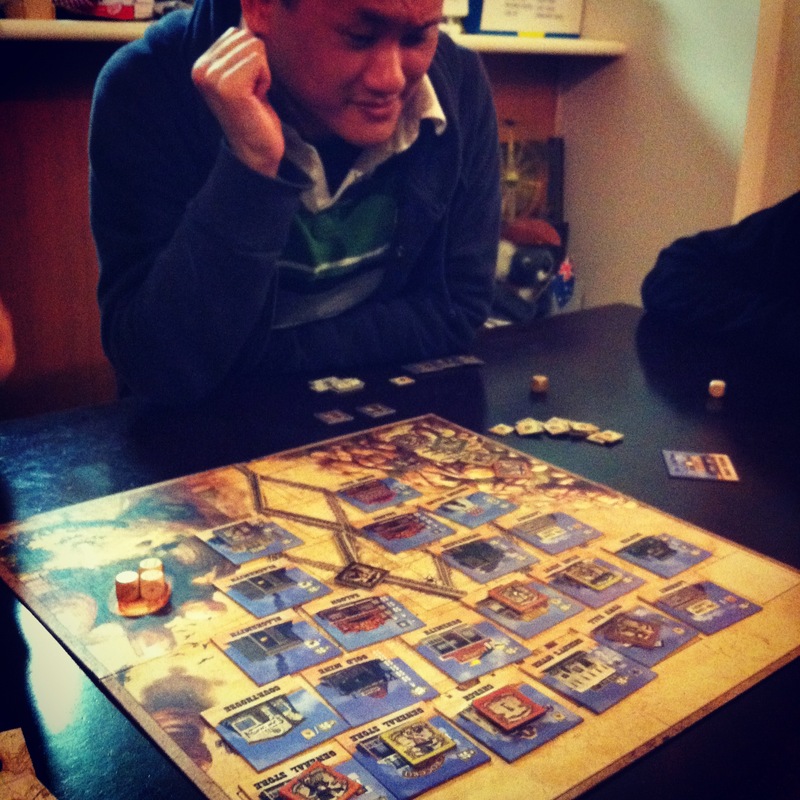 Deadwood is another worker placement style game. There are a number of buildings on the board, representing the growing town of Deadwood, which provide bonuses when you send your worker (Cowboy) there to “annex” the building. Most buildings also provide minor additional passive bonuses. Each player starts with 3 Cowboys and on in turn, you either send a Cowboy to Annex a building, or return one or more Cowboys to your Ranch (holding area) to be used in future turns. This goes on until one of the game end conditions triggers. The twist in Deadwood is that you can attempt to Annex a building that already has another player’s Cowboy there, which will trigger a Shootout. A Shootout is resolved using die rolls, based on the strengths of each Cowboy. There are 3 ranks of Cowboys which each provide increasing amount of dice in Shootouts. Killed Cowboys go to the Graveyard, effectively removing them from the game, while there is also a way to run away and abandon the building, but the Cowboy ends up at the Abandoned Mine, which uses up an action to get out. The object of the game is to have the most Cash when the game ends. Starting Shootouts and Annexing buildings could result in gaining Wanted posters, which negatively affect your final score as they require cash to be paid off at the end of the game. Wanted posters can also be removed throughout the game using certain buildings, such as the Chapel.The game ends once either of the game end conditions are met: The Wanted Poster pool runs out, a player has no remaining Cowboys alive, or the Train Station is built. The alternative to having Shootouts at highly coveted buildings is to expand the town of Deadwood using the Town Hall, which adds buildings to the board. However, the Town Hall also adds Railroad tracks to the board, which destroy any buildings in their way. Once all the railroad tracks are placed, the next activation of the Town Hall will result in the building of the Train Station, triggering the end of the game. Thus, there is a fair amount of control on when you can end the game. In this game, Jeff was quite unlucky as he was involved in a couple of early Shootouts which ended really poorly for him, leaving him with only one live Cowboy. Steven on the other hand, profited handsomely from the early aggression as he had a cowboy at the Undertaker which gave him cash whenever a Cowboy got killed. He also visited the Courthouse fairly regularly, as he always had the least number of Wanted Posters, and made the rest of us pay lots of cash for our misdemeanours. 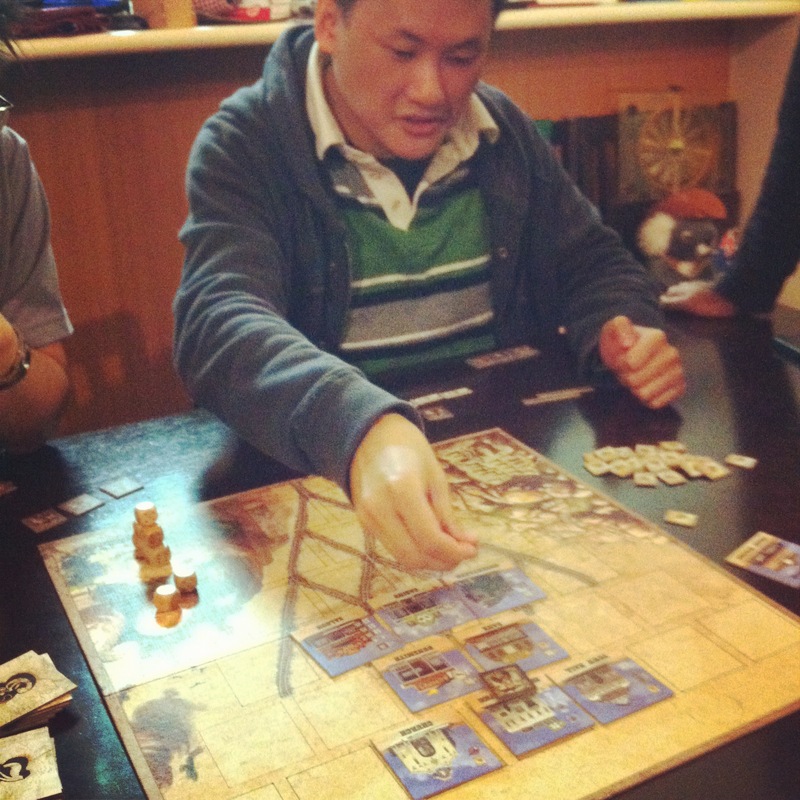 He also managed to take control of a Hotel right before the end of the game, which netted him a lot of cash. I believe Steven won this game quite comfortably. I liked some of the ideas in the game. I liked the concept of being able to force an existing Cowboy out, and the requirement to either annex a building each turn or skip a turn returning a Cowboy for future use. There were usually enough interesting decisions to be made to make the game engaging, and I thought the theme was implemented pretty well. However, I was ultimately underwhelmed as I felt it was just optimising money making actions, but there wasn’t really an engine you could build. Maybe it could happen, but the random building draw would make it pretty unreliable. I also didn’t like the dice roll system for the shootouts, as a lucky shot (or a string of unlucky ones) could completely negate your strategy, as happened with Jeff. I think I’d like to try this at least one more time, and see a different building progression, to see if there is more to the game but its not looking to great for Deadwood right now. It’s still a pretty solid game, I feel, but with my collection growing I fear it may get left on the sidelines in the future. All right. I’ve now finally caught up to all the weekly session reports and have played almost all the games in my collection… That is, without counting the new ones I just bought! I am looking forward to trying out Flash Point: Fire Rescue, Flash Duel, Dungeon Petz, Nexus Ops, and The New Era. I also now have my own copies of Alien Frontiers, Forbidden Island, Through the Ages and Bohnanza. And there’s still Rex that has yet to arrive. Looks like we will have to play even more games, starting this coming Saturday. Life is good, my friends. Until next time, happy gaming!